Jhong Hilario is quite known as one of the most sensational entertainers in the Philippines as he showcases his talent in dancing and in acting. He often plays the role of a villain in some of his most hit movies and TV series here in the local scene. But even though he mostly plays as a bad guy, he is a real charmer and a loving partner to his girlfriend, Maia Azores. Jhong Hilario, alongside Vhong Navarro, Danilo Barrios and some of the members of Streetboys, became famous and got the spotlight in the dance culture of Philippines. He gained a lot of attention in their career for executing death-defying stunts on his dance routines which made him become popular by earning the title "Sample King." Jhong's career blossomed in a noontime show called "It's Showtime" as a lot of network executives which eventually led him to become more active in the TV scene. He also has this unique ability to portray different types of roles such as being a villain but can quickly change it as a kind-hearted person. Although there are a lot of people thinking that Jhong is not a sweet in person, Maia insisted that it is the opposite personality of Jhong. 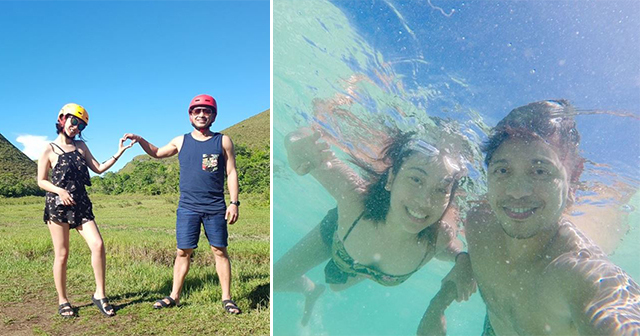 Jhong Hilario has been his boyfriend for six years and stated that he is more like a Superman for her. Although there are trials in their relationship, Jhong and Maia had worked so hard for themselves to endured all the problems that tested their relationship. Jhong constantly keeps on being a romantic person and sincere boyfriend as they stayed longer for six years as a couple. Despite their working status and hectic work schedules, Jhong still makes up for her by traveling, eating out on some random restaurants, and having adventures together with Maia which they genuinely love. The two plans out their alone time for each other to relax and celebrate their relationship. Jhong had a failed relationship with his ex-wife, Michelle Westgate, yet he was still lucky enough to find love again with Maia. Even though they have a few bumps in their relationship, Jhong still find a way to prove his love with Maia. In 2014, Jhong announced his relationship status with Maia to the public. It was a bit of controversy because Maia was still a college student back then. Maia's family was not that inclined to their relationship as they have learned in Jhong's interview in Anthony Taberna's show "Tapatan ni Tunying" that the two were currently dating. They were against their relationship because Jhong was too old for Maia. The two fought for their relationship and thrived to withstand all the hardships in their life. “Ito kasi ‘yong babaeng ipinaglaban ko talaga kahit sinabing hiwalayan na. Mali ko lang din kasi nag-aaral pero no’ng nalaman ng family na ako ‘yong boyfriend, and siyempre dumaan sa masusing pag-iimbestiga ‘yan, kung ako ba ‘yong Gary sa Mara Clara, pero na-prove ko naman sa kanila na malinis ang intensyon ko,” Jhong explained in his interview. What are your thoughts about their love? Share it through this article!